MURRYSVILLE, Pa. - A 16-year-old boy described as quiet and shy flailed away with two knives in the crowded halls of his suburban Pittsburgh high school Wednesday, stabbing and slashing 21 students and a school police officer before an assistant principal tackled him, authorities said. At least four students were in critical condition Wednesday evening, including a boy who was on a ventilator after a knife pierced his liver, missing his heart and aorta by only millimeters, doctors said. The suspect, identified as Alex Hribal, a sophomore at the high school, was taken into custody and treated for a minor hand wound.Witnesses said he maintained a "blank expression" during the attack. Hribal was charged as an adult on Wednesday with four counts of attempted homicide and 21 counts of aggravated assault. He was shackled by his hands and feet and was dressed in a hospital gown in his appearance before a magisterial district judge. The rampage - which came after years in which U.S. schools have geared much of their emergency planning toward mass shootings, not stabbings - set off a screaming stampede, left blood on the floor and walls, and brought teachers rushing to help the victims. Investigators have not determined a motive, but Murrysville Police Chief Thomas Seefeld said they were looking into reports of a threatening phone call between the teenager and another student the night before, CBS Pittsburgh reported. Seefeld didn't specify whether the boy reportedly received or made the call. The attack unfolded just minutes before the start of classes at 1,200-student Franklin Regional High School, 15 miles east of Pittsburgh. Police said it was over in just minutes. Witnesses said the attacker at first tackled a freshman and stabbed him in the belly, then got up and ran wildly down the hall, slashing other students. The knives were as long as 10 inches, authorities said. Nate Moore, 15, said he saw the first attack and was going to try to break it up when the teenager got up and slashed his face, requiring 11 stitches. "It was really fast. It felt like he hit me with a wet rag because I felt the blood splash on my face. It spurted up on my forehead," he said. The attacker "had the same expression on his face that he has every day, which was the freakiest part," Moore said. "He wasn't saying anything. He didn't have any anger on his face. It was just a blank expression." 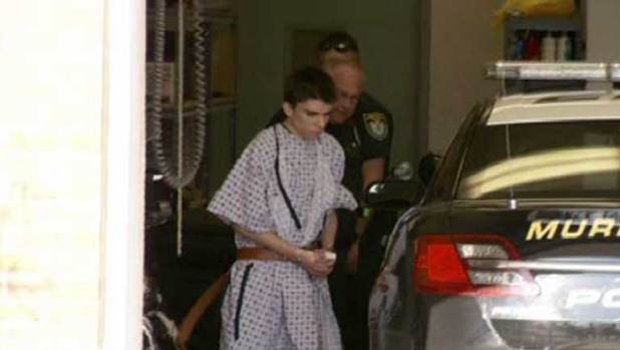 Moore and 16-year-old Mia Meixner called Hribal a shy boy who largely kept to himself, but they said he was not an outcast and they saw no indication he might be violent. Pennsylvania Gov. Tom Corbett praised the reaction of the students and staff at the school. "There are a number of heroes in this day," he said. He commended students who remained with their friends, teachers and other staff who pulled students out of hallways to safety, cafeteria workers who cared for wounded students and an assistant principal, Sam King, credited with subduing the assailant. Such attacks are very difficult to prevent, Corbett said. "It could have occurred in the school parking lot before they got inside," he said. "It could have occurred in a restaurant or a shopping center at the same time. It certainly brings it to everybody's attention when it occurs inside of a school where all of our children go and we hope that they are safe and we believe that they are going to be safe." Doctors said they expected all the victims to survive, despite large and deep puncture wounds to the abdomen in some cases. The wounded campus police officer was released from the hospital. A local hospital said that one student applied pressure to an injured classmate, possibly saving the student's life. A student, Ian Griffith, said he saw the school police officer confront the student, who then stabbed the officer. King then tackled the boy, Griffith told the Pittsburgh Tribune-Review. King's son told The Associated Press that his father was treated at a hospital, though authorities have said he was not wounded by the knife. "He says he's OK. He's a tough cookie and sometimes hides things, but I believe he's OK," Zack King said. The son added: "I'm proud of him." King lives just up the street from Hribal's family. The police chief called Sam King's actions admirable. "I can tell you what we saw when we got there was the hallway that was pretty much in chaos as you can imagine, a lot of evidence of blood on the floors in the hallway," Seefeld said. "We had students running about trying to get out of the area." Meixner said the initial assault touched off a "stampede of kids" yelling, "Run! Get out of here! Someone has a knife!" Michael Float, 18, said he had just gotten to school when he saw "blood all over the floor" and smeared on the wall near the main entrance. Then he saw a wounded student. "He had his shirt pulled up and he was screaming, 'Help! Help!'" Float said. "He had a stab wound right at the top right of his stomach, blood pouring down." Someone, possibly a student, pulled a fire alarm after seeing some of the stabbings, the police chief said. Although that created chaos, Seefeld said, it emptied out the school more quickly, and "that was a good thing that that was done." Several students told CBS Pittsburgh the person who pulled the fire alarm was student Nate Scimio. Scimio, 17, later posted a photo on Instagram showing himself posing in a hospital gown and pointing to a bandaged stab wound on his arm. Also, a girl with "an amazing amount of composure" applied pressure to a schoolmate's wounds and probably kept the victim from bleeding to death, said Dr. Mark Rubino at Forbes Regional Medical Center. "We haven't lost a life and I think that's what we have to keep in mind," said county public safety spokesman Dan Stevens.